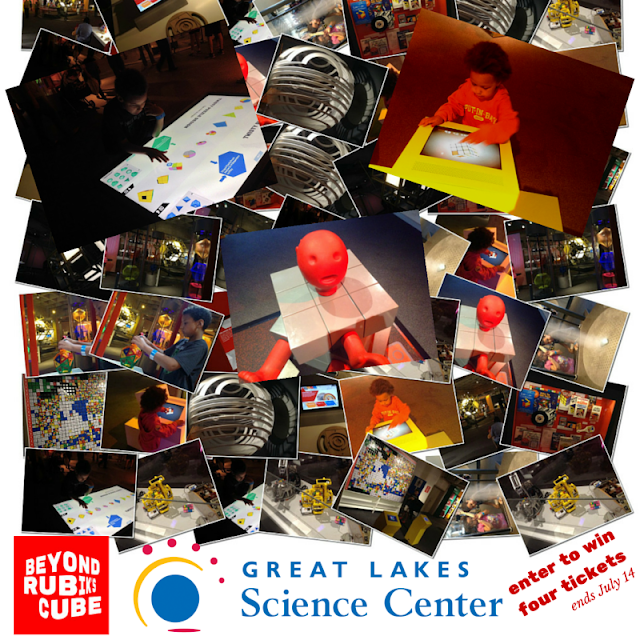 We received admission to the Great Lakes Science Center to facilitate this review and sweepstakes. Opinions are my own. I had a Rubik Cube when I was a kid. I never solved it. If I solved two sides, I felt like a genius. It never occurred to me to look up a book in the library, I had friends who were smarter and finished it for me. Now you can Google how to solve it but, to be honest, I haven't thought about the Rubik cube in years. And, then Beyond Rubik's Cube came to Great Lakes Science Center and my fascination with the amazingly, complicated toy was renewed, but not for me - for my kid. He is so visual. I knew he would love it. I also have four tickets to giveaway at the end of the post to one lucky winner! And, would you believe there is more! I was right, by the way, I lost my kid as soon as we arrived. Maybe lost is the wrong word to use but it's the only one that really fits. Thankfully, there is only one way in and one way out, plus he is practically a tween. But I digress, he was so amazed at this exhibit. It wasn't just him though, my five-year-old could not be dragged away from building her own puzzle. We spent two and half hours exploring, sharing and playing. It was a perfect way to spend a rainy afternoon. There was also time to catch a Big Science Show about airflow and to spend time watching the tornado maker.